Tieka “OurWar” – Squad Leader Review | The Fighting 1:18th! 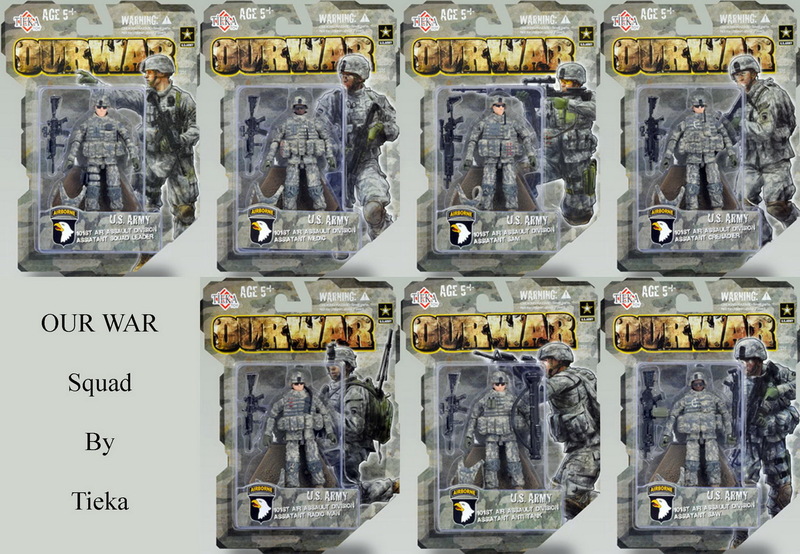 One of our Forum members, Custer7thCav was kind enough to do a review on the upcoming Tieka “OurWar” Squad Leader figure that he got from China a little while back. These figures are being imported by Merit International and should be available stateside sometime next month from your trusted online retailers like Foxhole Toys etc. 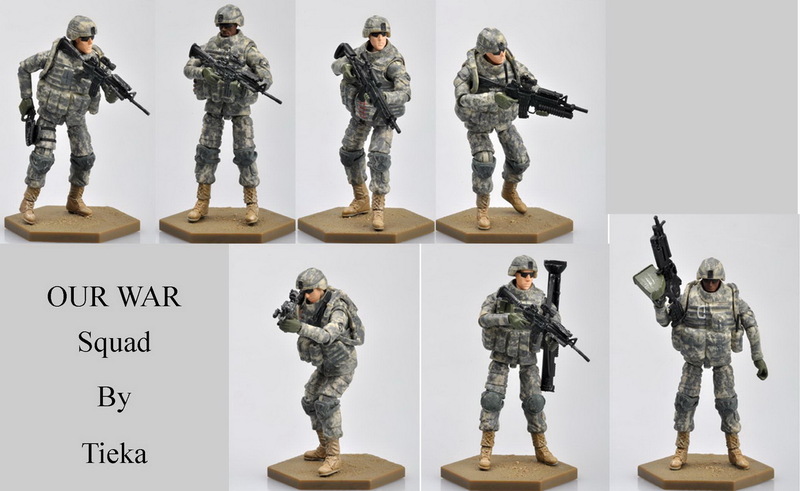 Forums were abuzz a few months back with the advent of the OURWAR line of U.S. Modern military figures representing the 101st airborne in the ACU pattern camouflage. These figures are available online via eBay from China at around 12 dollars per figure and available for pre-order in the US via retail outlets for around 8 or 9 dollars per figure. 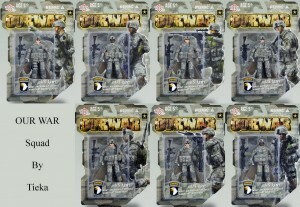 The series so far has 7 figures that include a Squad leader, Squad Appointed Marksman, Radioman, Medic, Grenadier, Anti Tank Weapon/rifleman, and Squad Assault Weapon operator. I plan to review each figure in the line, but right now, time permits me the opportunity to review the squad leader figure. Squad Leader: I have opened the squad leader and will assess it based on packaging, accessories, articulation, compatibility with other 1:18 figures and general impression and observations. I will rate on a scale of 1 (Fodder) to 10 (Fantastic). Packaging: The packaging is attractively designed and functional. I like the graphic work on the card and the plastic is sturdy. 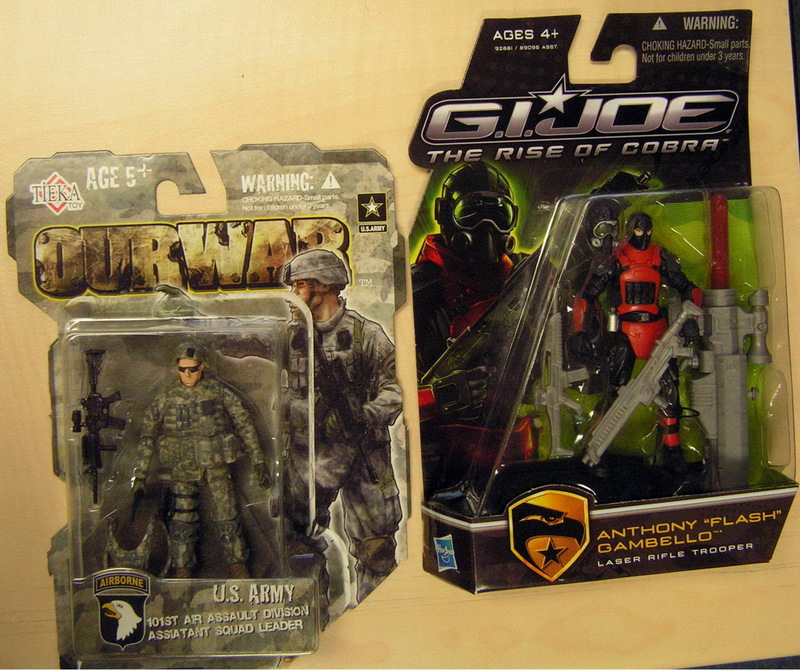 It is a bit smaller than a GI JOE ROC package. Accessories: Upon opening the packaging and removing the figure identification card stock in the bottom of the plastic, one will discover additional knee/elbow pads. The pads are flexible and are easy to place upon the figure. The helmet, camel-back hydration pouch and combat vest are all removable with ease. The figure comes with a dark tan base with subtle texture to represent sand or rocky earth as would be found in current theaters of operation for US troops. An M-4 and 9mm Beretta (held in the figures hand but able to be placed in a working holster –though prone to falling out if moved too quickly) are included weapons. 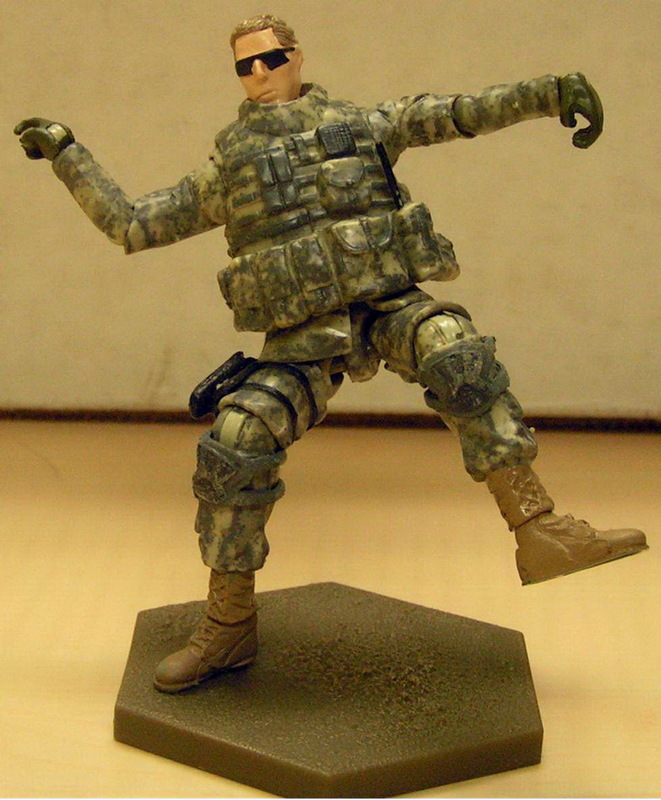 Articulation: The figure can stand without the assistance of the base. It has good articulation and a nice feature is the wrist articulation. It can be placed in running and crouching positions easily. I did find the arm articulation when fully geared up was okay but I would like it to have a better and tighter to the chest ability to hold weapons in a shooting pose. I will need to play a bit more to see if I can have it assume the poses I desire. Kneeling poses are okay and again I may be a bit demanding in poses that are realistic but understand the limitations of the figures. The foot articulation is similar to a JOE 25th Anniversary which I like. The head swivels well but has the sunglasses molded on which would have been a nice separate accessory but I can live with it. 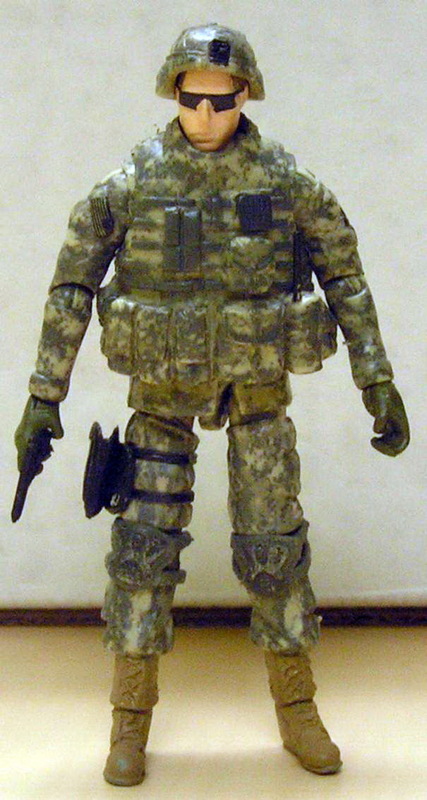 The head does not swap easily with Joe figures or star wars figures and vice versa. I suppose those with a dremel and patience could modify it. I am not one of those people. 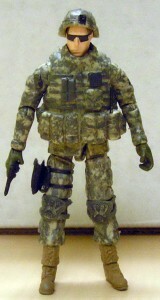 Overall it is a very good articulated figure. Next: YT74 visits the Ropkey Armor museum! Thanks for the review! I like that the camelbak comes off and the articulation seems pretty good so far. Although they are a little smaller than the other lines they should still fit in pretty good for a “green shirt”. 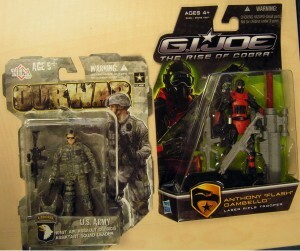 Judging by the pictures I would have to agree with the rating so far, especially with the removable parts. Can’t wait for the others to get a review. This line looks promising.